Here are the 2020 consensus ratings for Senate, House and Governor. 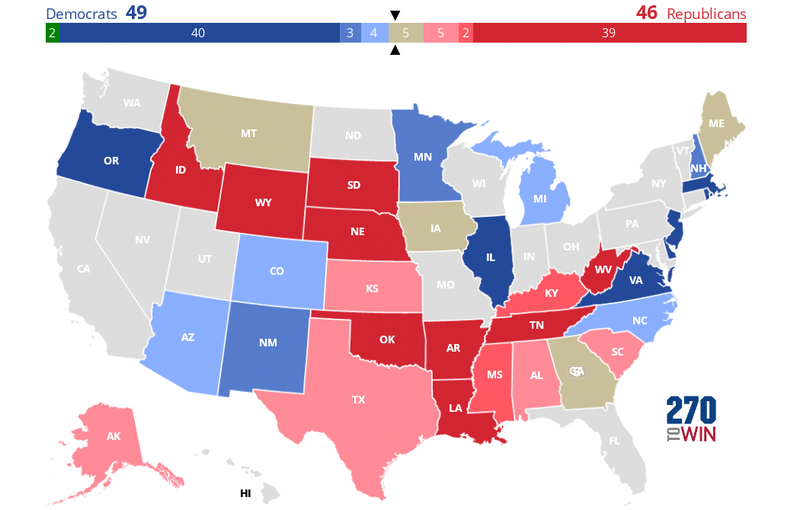 At this time, they are based on the initial ratings of three forecasters: Sabato's Crystal Ball, The Cook Political Report and Inside Elections. We'll keep this map updated and likely add more projections as they become available. Click any of the maps for the permanent URL, as well as an interactive version. Note that only races seen as safe by all three forecasters are given the darkest shade of red/blue on the map. This allows for the broadest look at the competitive landscape. 34 seats will be contested in 2020, including a special election in Arizona. 22 are held by the GOP, 12 by Democrats. To take control, Democrats will need to gain 3 or 4 seats. As is the case every two years, all 435 seats will be up for election in 2020. Democrats currently hold 235 seats to 197 for the GOP. There are three vacancies; all were previously held by Republicans. If we assume those will stay in Republican hands*, that party will need to gain 18 seats to regain the control lost in the 2018 midterms. Kentucky, Louisiana and Mississippi hold gubernatorial elections in 2019, with 11 more states to follow in 2020. Despite the deep-red lean of these states in presidential contests, all three races are seen as competitive, helped by the fact that they are taking place in an off-year. The country's governorships are roughly split between the two parties, with Republicans holding 27 of the 50. * Two of these, NC-3 and PA-12, are safe GOP seats. NC-9 is much more of a toss-up. That seat has been vacant since the start of this Congress, as the November results here were not certified due to fraud allegations. A new election was recently ordered by the North Carolina Board of Elections. The Pennsylvania special election will be held on May 21; the North Carolina dates are not yet known. Vermont Senator Bernie Sanders is joining the 2020 Democratic presidential field. He made the announcement on Tuesday. Sanders 2016 campaign, where he finished runner-up to Hillary Clinton, helped push the party to the left. The question will be whether he can stand out in a much larger 2020 field that will include a number of ideologically similar Democrats. Sanders is the 6th Democratic Senator to join the race. The 'Road to 270' calculator is now available below the 2020 Electoral College Map. The feature uses your forecast to determine the number of winning combinations* available for each party, as well as any possible 269-269 ties. As you change your map, the number of combinations automatically updates. For example, this map reflects the nine locations decided by a 3% or less popular vote margin in 2016. 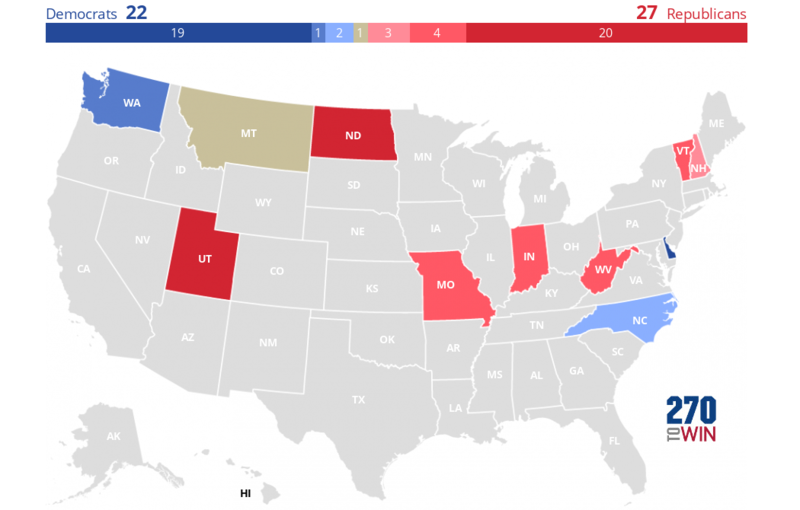 There are a pretty even number of paths to 270 electoral votes. However, if you give Florida to the GOP, the number of Democratic options becomes much more limited -- with several states becoming must wins. A combinations detail page is also available; it allows you to look at the specific paths available based on your map. This page is also interactive, letting you further narrow down the possibilities. * To keep things manageable, undecided states are assumed to be decided from most to fewest electoral votes. For a very simple example, let's say a party has 251 electoral votes, with PA (20) and NH (4) remaining to be decided. Since PA alone will get the party to 270, that is the only winning combination. In this case, winning or losing NH doesn't matter in terms of reaching 270, and so PA + NH is not displayed. See this article for more information on this tool. Former Massachusetts Gov. Bill Weld is exploring a primary challenge against President Trump. Weld announced the launch of an exploratory committee at a New Hampshire breakfast on Friday morning. Weld served two terms as Massachusetts governor during the 1990's. More recently, he was the Libertarian Party's vice-presidential nominee in 2016. On the ballot with Gary Johnson, the Party received over 3% of the nationwide vote. This was the best 3rd party performance since Ross Perot in 1996. It remains to be seen how much traction Weld will get or if he proceeds with a campaign. However, it is worth noting that the history of serious incumbent primary challenges in the modern era is not a good one - either for the challenger or the sitting president. A strong primary challenge highlights fractures in a party, and often weakens the incumbent in the general election. We saw this most recently in 1992, where George H.W. Bush fended off Pat Buchanan, but lost the general election to Bill Clinton. Interestingly, that situation is somewhat the mirror of today. Trump represents the now-ascendant populist wing of the party, while someone like Weld would potentially appeal to the type of GOP championed by the Bushes. In 1976 and 1980, presidents Ford and Carter faced serious primary challenges. Both prevailed but were defeated in the general election. Another type of situation occurred in 1968, where President Johnson faced a challenge from Sen. Eugene McCarthy, who ran on an anti-Vietnam War platform. McCarthy's strong early showing caused Johnson to abandon his re-election effort. Ultimately, McCarthy didn't win the nomination and Republican Richard Nixon was elected in November of that year. Politico reports that President Trump's advisers are focusing their efforts on three of the declared 2020 Democratic presidential contenders. Senators Cory Booker (NJ), Kamala Harris (CA) and Elizabeth Warren (MA) are seen by the campaign as the most viable candidates at this point. The advisers believe the list of Democrats in the race will grow significantly before summer and expect that their target list will evolve over time. Trump himself believes former Vice-President Joe Biden would be the most formidable general election rival. Overall, there are 9 Democrats in the 2020 field. We've got 25 names on our list of prospective and announced candidates. There are 17 Democratic women in the U.S. Senate. With her announcement Sunday, Minnesota Sen. Amy Klobuchar becomes the 4th of those to join the 2020 presidential race. She follows Kamala Harris (CA), Kirsten Gillibrand (NY) and Elizabeth Warren (MA). Warren officially joined the race on Saturday. There are now nine* Democrats seeking the party's nomination. Interestingly, of all the Democrats that may run in 2020, none are from a state that was as closely-contested as Minnesota in 2016. Hillary Clinton prevailed here by just 1.5% over Donald Trump, as it nearly joined the blue wall states of Michigan, Pennsylvania and Wisconsin that powered Trump's win. On the other hand, Minnesota has not voted for a GOP nominee since Richard Nixon in 1972, the longest such state single-party streak^ in the nation. The Cook Political Report has started the state as Leans Democratic in 2020. * Including two that have formed exploratory committees; one step short of a formal announcement. ^ Washington, D.C. has had 3 electoral votes since 1964. It has never voted Republican. Curious about your state's streak? See our Same Since Electoral Maps. Rep. Rob Woodall will not seek a 6th term in 2020. The Georgian Republican narrowly won re-election in November; his margin of victory over Democrat Carolyn Bourdeaux was less than 500 votes. After Woodall's announcement; Bourdeaux indicated she would run again in in 2020. The race is again likely to be closely-contested. As the Atlanta Journal-Constitution notes, "the race to represent the 7th District, which includes portions of Gwinnett and Forsyth County, was the closest congressional race in the country last year. Once lily white and deeply conservative, it’s now at the center of the demographic shifts that have transformed Atlanta’s wealthy suburbs into political battlegrounds."